Architect Andrew Franz first caught our eye when we spotted his incredible renovation of a West Village townhouse just months ago. Since then, we’ve often found ourselves ogling his site for design inspiration, further falling in love with his ability to blend the old with the new through thoughtful material choices and a unique use of light and space. It goes without saying Andrew is a standout amongst the city’s seemingly inexhaustible supply of homogeneous architects. 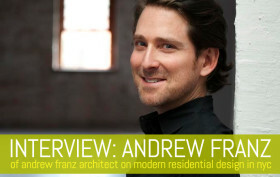 We recently caught up with Andrew to find out about some of his latest projects, how collaboration plays into his process, and how he approaches the design of homes and buildings in a dynamic and storied environment such as New York City. Keep reading to find out what he had to share with us.